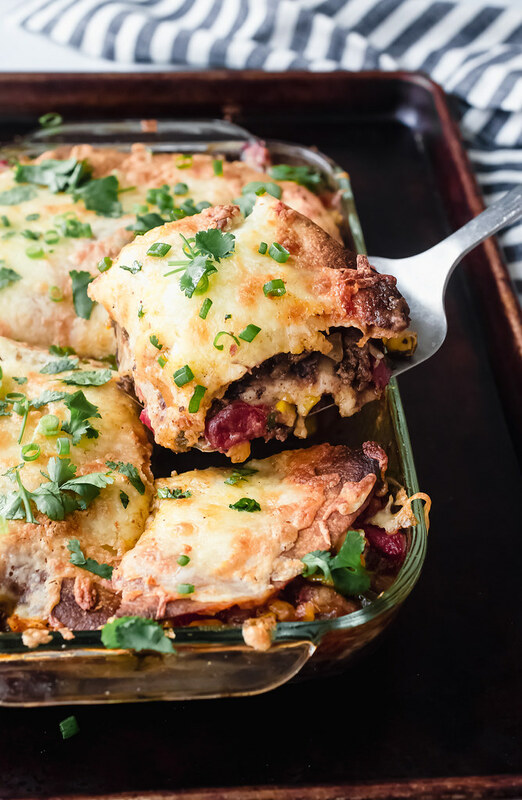 Taco Lasagna: A toddler-approved spin on tacos with layers of refried beans, corn salsa, seasoned beef, tortillas, and a ton of melted cheese. How many taco lovers am I talking to right now? Come on now, raise your hands! I know you’re out there! I’ve never actually met a person in my entire life who didn’t like tacos. Have you? I mean, yeah, they’re a little messy to eat sometimes but there are ways to get around that. Taco salad, for one! So you could imagine my utter delight when I found out that Riley had been inhaling the deconstructed tacos her daycare had been serving for lunch. At 9 months old. Yep! We got her started on solid food at 6 months old with baby led weaning and this was one of the best decisions we’ve made as parents yet! We started with really soft roasted sweet potatoes and chunks of avocado, both of which she absolutely loved. By 8 months, we had moved her on to food like shredded chicken, steamed broccoli, roasted cauliflower, chicken parmesan meatballs (no sauce or cheese), and pasta with pureed avocado sauce. The avocado sauce was similar to the sauce I made for my avocado pasta with burst cherry tomatoes but it was literally just avocado pureed with a little bit of olive oil to help thin it out. And while this was BY FAR the messiest of all the meals we made for her, it was also one she really loved. By 9 months, we gave her daycare the go-ahead to start feeding her the “school lunch.” This relieved me of having to pack a lunch for her each day and it gave her the chance to try lots of new foods. Win-win! So a few weeks ago when I was trying to decide what to do with the pound of sad, unused ground beef in my fridge that was due to expire in a few days, I firmly decided on making tacos. Tacos are ALWAYS a dinner win for us! I was out of my homemade taco seasoning and at 5pm, getting dinner on the table was more important than remaking a batch of the seasoning for tacos that night. We didn’t have any taco shells. We DID have half of a package of flour tortillas in the fridge from some black bean and spinach quesadillas I had made earlier in the week. However, since Kyle doesn’t like soft tacos (eyeroll), that idea was out. Buuuuuut! If I made the soft tacos into a taco lasagna with the tortillas as layers, I knew he would eat them that way. So I pulled cans of black beans and tomatoes from the pantry and some frozen corn from the freezer and I got to work. Several lasagna layers quickly emerged from my pantry staple ingredients. First, I mixed the tomatoes and corn into some sauteed onions and garlic, which made a quick corn salsa. Then I browned the ground beef and threw in some spices at the end of the cooking time. This gave the spices’ flavors a chance to bloom without being overcooked. And lastly, I made a really quick version of my favorite refried black beans. I cooked the beans in the same pan I had cooked the beef in so they picked up some of the flavor from the taco-seasoned meat. But these refried beans were literally just the beans cooked in some chicken broth, salt, and pepper, and then mashed. So insanely easy to make! I layered each component with some shredded cheddar and jack cheeses between the tortillas and then baked the whole taco lasagna off until it was bubbly and browned. And let me tell you something. 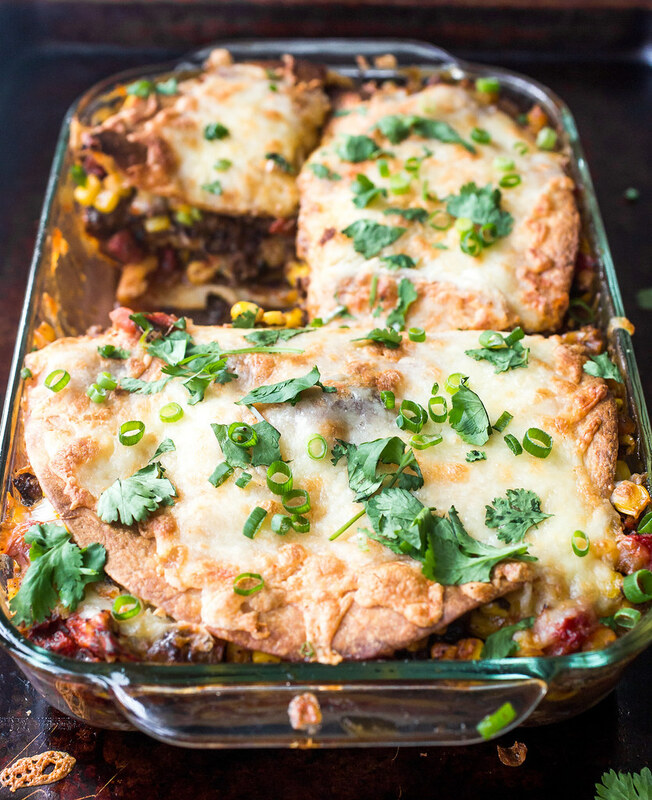 If you ever need to get your toddler to eat a decent meal, serve her this taco lasagna. Seriously! Riley could not shovel this into her mouth quickly enough! I honestly couldn’t believe my eyes while we were eating dinner that night. It was an easy meal for her to eat too. Soft textures, bold flavors without any heat, and the lasagna can be chunked into pieces to eat with fingers or a fork (go Riley!). I know I say this a lot about the recipes I share here with you but this recipe is going into our regular rotation. 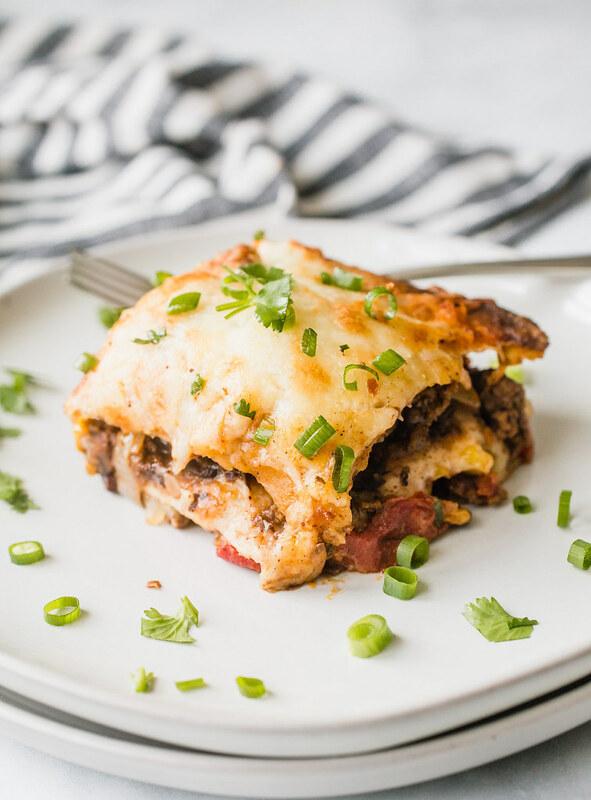 It was a big winner all around and since the leftovers reheat really well, making this taco lasagna on a Sunday for easy and QUICK weeknight meals is kind of a no-brainer! I hope you enjoy this one as much as we do!! 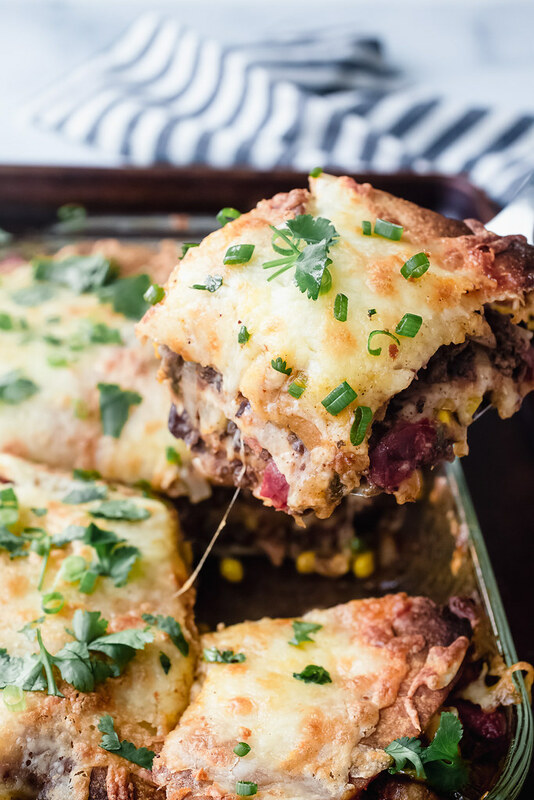 This taco lasagna is a toddler-approved spin on tacos with layers of refried beans, corn salsa, seasoned beef, tortillas, and a ton of melted cheese. Delish! 6 8-inch tortillas (either homemade or store-bought - flour or corn - sometimes sold as "fajita size"
While the oven heats, heat 2 tablespoons of oil in a large skillet over medium heat and then add the onions, garlic, and a good pinch of salt and pepper; cook, stirring occasionally, until the onions start to soften, about 4-5 minutes. Stir in the tomatoes and their juices, corn, and another smaller pinch of salt and pepper. Cook for 3-4 minutes, stirring occasionally, until the corn is no longer frozen. Transfer the mixture to a medium bowl and set aside. In the same pan over medium-high heat, cook the ground beef, breaking it up into smaller pieces while it cooks. Cook for 5-7 minutes until it's no longer pink and then drain off all but 1 tablespoon of the fat. 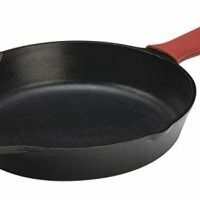 If you used a lean beef and no fat remains, add a drizzle of olive oil to the pan. Stir in the chile powder, cumin, coriander, and oregano and cook for about 1 minute, just until the beef is evenly coated and you can start to smell the spices. Transfer the beef to a medium bowl and set aside. In the same pan over medium heat, drizzle in some olive oil and then add the beans. Cook, stirring them around for a couple of minutes to heat them up. Pour in the chicken broth and simmer the beans in the broth for about 5 minutes. When the beans start to soften, turn the heat down to low and mash the beans in the pan with a fork until they are mostly mashed with just a few whole beans remaining here and there. Stir the mixture together as you go to incorporate the broth into the mashed beans. Remove the beans from the heat. 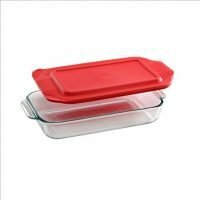 Grease an 11×7-inch baking dish (a 13×9-inch dish will work too but your lasagna will be thinner and you'll need extra tortilla to cover the additional area of the dish). Place 2 of the tortillas on the bottom of the dish, slightly overlapping in the centers like a venn diagram. 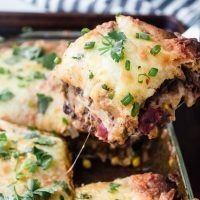 Spread half of the black beans in an even layer over the tortillas followed by half of the tomato-corn mixture, and then half of the beef. Sprinkle 1 ½ cups of the cheese over the beef and the place 2 more tortillas over the cheese. Repeat with the remaining ingredients in the next next layer. Drizzle a little bit of olive oil over the top of the tortillas at the top of the lasagna and coat them evenly with the oil. Alternatively, you could spray them with some cooking spray or oil (spray coconut oil works well here too). Cover the baking dish with foil and place the dish on a baking sheet. Bake for 20 minutes then remove the foil and bake uncovered for another 10-15 minutes, just until the tortillas are lightly browned. Sprinkle the remaining cheese over the top of the lasagna and baked for another 5 minutes or so, just until the cheese has melted. Remove from the oven. 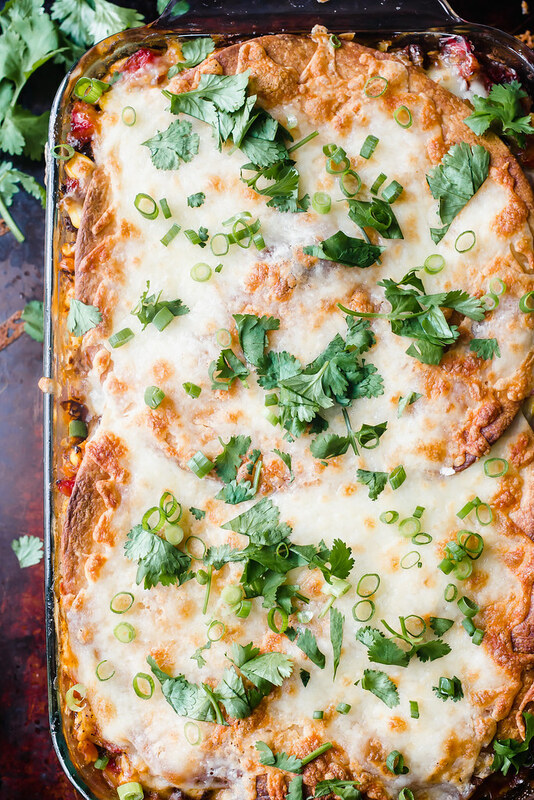 Allow the lasagna to sit for 5-10 minutes before garnishing with the chopped scallions and cilantro. Divide into 8 pieces and serve with sour cream. Storage: Leftovers keep well in the fridge for about 3 days and they make for a really delicious lunch or dinner-in-a-pinch when the toddler is clawing at your ankles for food when you get home from work. Just sayin'! I've made this recipe with both sweet corn kernels and regular corn kernels and we liked it much better with the regular corn. Believe it or not, the sweet corn did actually give the dish a sweet flavor which we did not love with the rest of the flavors of this taco lasagna. 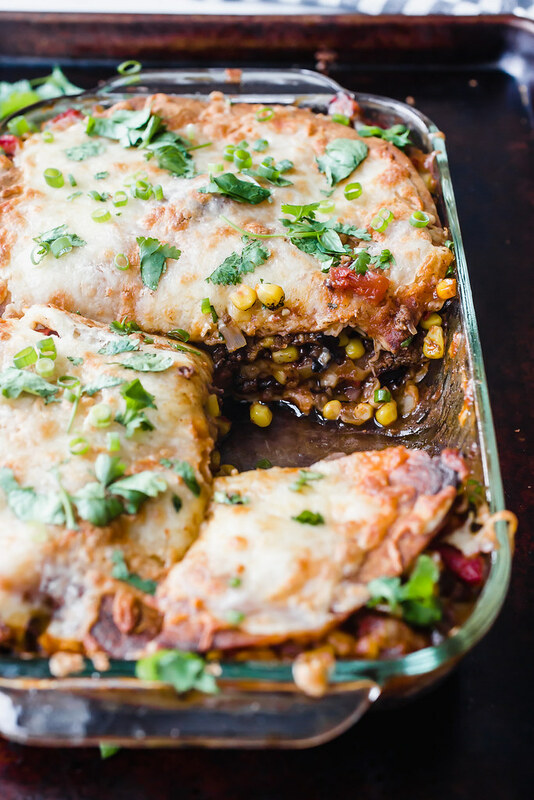 Also, if you want to spice this lasagna up, I say go for it! 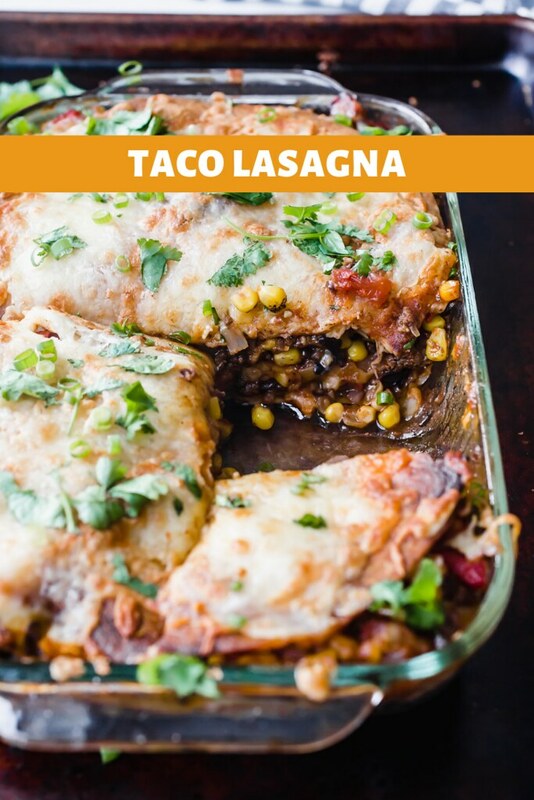 You can add some minced jalapeño to the tomato-corn salsa and/or use hot chili seasoning to give this taco lasagna some kick. Do you think I could omit the meat and make this vegetarian or maybe use shredded chicken? My kids don’t love beef? Oh for sure! For a really quick meal, you could mix some shredded rotisserie chicken with the taco seasoning. Or for a vegetarian meal, you could saute some peppers and mushrooms in place of the beef. I think either would be delicious swaps for the beef! Let me know what you decide to do and how it turns out! !